Laparoscopic Minor Pancreatic Resections (enucleations/atypical Resections). a Long-term Appraisal of a Supposed Mini-invasive Approach. Renato Costi, MD PhD, Bruto Randone, MD PhD, Frédéric Mal, MD, Silvia Basato, MD, Hugues Levard, MD, Vincenzo Violi, MD, Brice Gayet, MD. 1 Département de Pathologie Digestive, Institut Mutualiste Montsouris, Paris, France; 2 Dipartimento di Scienze Chirurgiche, Università degli Studi di Parma, Parma, Italia. Laparoscopic pancreatic enucleation is increasingly performed worldwide. Few retrospective, small-sized studies show encouraging results (at least for procedures performed outside the pancreatic head), but do not allow for an evaluation of laparoscopic enucleations feasibility and effectiveness. The objective of this retrospective study is to assess the short- and long-term outcome of laparoscopic minor pancreatectomy, including enucleation and atypical resection. 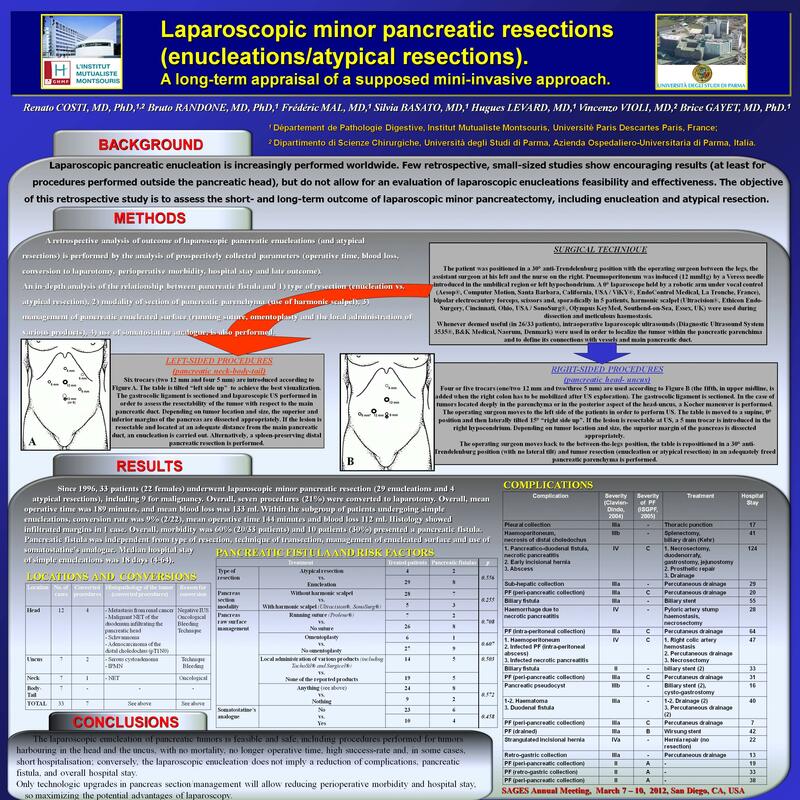 A retrospective analysis of short- and long-term outcome of laparoscopic pancreatic enucleations (and atypical resections) is performed by the analysis of prospectively collected preoperative and intraoperative parameters (operative time, blood loss, conversion to laparotomy, perioperative morbidity, hospital stay and late outcome) both in the whole series (including patients undergoing atypical resections and synchronous major procedures), and the subgroup of patients undergoing simple enucleations. An in-depth analysis of the relationship between the occurrence of pancreatic fistula and 1) type of resection (enucleation vs. atypical resection), 2) modality of section of pancreatic parenchyma (use of harmonic scalpel), 3) management of pancreatic enucleated surface after tumor extirpation (including running suture, omentoplasty and the local administration of various products), 4) use of somatostatine analogue, is also performed. Since 1996, 33 patients (22 females) underwent laparoscopic minor pancreatic resection (29 enucleations and 4 atypical resections) for various affections, including malignancy (9 patients). Overall, seven procedures (21%) were converted to laparotomy; of them, 5 occurred among the first six procedures performed. Overall, mean operative time was 189 minutes, and mean blood loss was 133 ml. Within the subgroup of patients undergoing simple enucleations, conversion rate was 9% (2/22), mean operative time 144 minutes and blood loss 112 ml. Histology showed infiltrated margins in 1 case. Overall, morbidity was 60% (20/33 patients) and 10 patients (30%) presented a pancreatic fistula. Pancreatic fistula was independent from type of resection, technique of transection, management of enucleated surface and use of somatostatine’s analogue. Median hospital stay of simple enucleations was 18 days (4-64). The laparoscopic enucleation of pancreatic tumors is feasible and safe, including procedures performed for tumors harbouring in the head and the uncus, with no mortality, no longer operative time, high success-rate and, in some cases, short hospitalisation; conversely, the laparoscopic enucleation does not imply a reduction of complications, pancreatic fistula, and overall hospital stay. Feasibility of laparoscopic atypical pancreatic resection is still to be confirmed, as well as that of procedures performed for malignant disease. Only technologic upgrades in pancreas section/management will allow for the reduction of perioperative morbidity and hospital stay, so maximizing the potential advantages of laparoscopy.